FOX's British adaptation GRACEPOINT can be a completely solid show, with the potential to be the best "whodunit" show since The Killing. On Thursday, FOX displayed its attempt at a British adaptation. Broadchurch, the British show from network ITV, was an incredible popular eight-episode series that made critics go bananas basically, stating it as one of the best dramas of the year. So of course America would do a remake. It’s what we do. 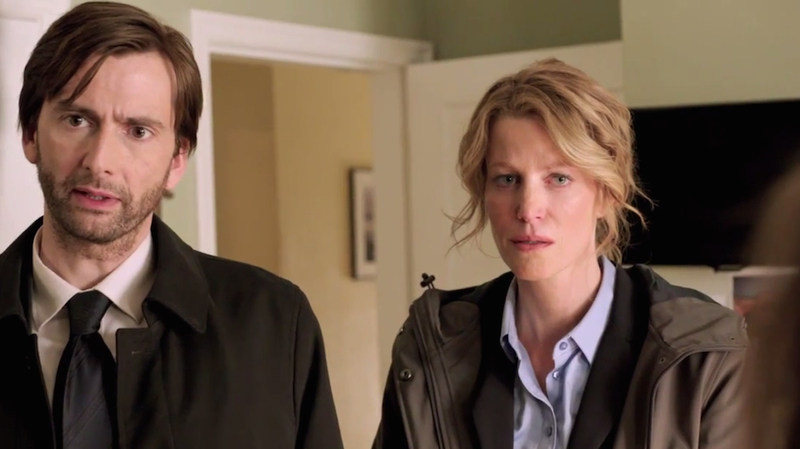 Gracepoint is about a small community being destroyed by the death of a 12-year old boy, investigated by newcomer Det. Emmett Carver (David Tennant) and Det. Ellie Miller (Anna Gunn). What follows is the city’s slow decline into darkness (small town secrets revealed, accusations thrown. The works). The premise was not bad at all. We start the day with the Solano family starting their day, Mark Solano going through his morning routine seeing everyone on the main street of Gracepoint, all without the knowledge that their world would be shattered soon enough. Det. Ellie Miller returns from her vacation to find her locked-in promotion was given to newbie Detective Emmett Carver. Both attend to a boy found at the beach, and it’s revealed to be Miller’s best friend’s son Danny Solano. What happens next? Well, the community finds out and everyone is completely floored by the news. Let’s talk character development. I know, surprise, surprise: the Doctor Who fan loves David Tennant. But you can’t deny he’s just a brilliant actor. As Det. Carver, he does a pretty solid job. I’m not too convinced on the American accent, and knowing his acting ability, I thought he was trying too hard to be “True Detective”. But the character himself comes off as challenging in every different way, and is interesting. The same to Anna Gunn, who has the advantage of having a non-Breaking Bad viewer see her as just the character she’s setting out to be. I thought she, too, was solid. I think she hasn’t completely settled in her role quite yet, but she’ll get there by the 3rd episode if not the next episode. As for the Solano family (who sadly lost their child), they were completely unconvincing. From the get-go, I was not a fan of the mom or dad. Daughter Chloe, played by Madalyn Horcher, is pretty good and very convincing. Michael Pena as Mr. Solano was just not very good, practically unmoved by the news of the tragic death (it took him to see the body where I got some emotion from him…but not convincingly). The mother wasn’t a great actor. I really wasn’t buying her relationship with Det. Miller. Also, when she reached Danny’s body and they were taking her away, she wasn’t trying to reach the body. She was flailing randomly. Her performance felt more distant than I would have hoped. As for the rest of the supporting cast, they did a solid job supporting. I have no complaints about them. The plot itself started off pretty well and was actually very interesting. I liked how it was pointing at suicide, then twisted to homicide. I liked how something as simple as checking on a son at night could actually make a difference between life and death (and possibly wreck a marriage). I liked how the kid had thought to be abducted, only to show he was skateboarding away on his own. I liked how Danny’s best friend is involved somehow. I even liked that a major newspaper reporter stole a stuffed animal for no apparently good reason. I liked everything about it. It went from a suicide to homicide to a possible conspiracy in 40 minutes, and there’s not nice bow to tie at the end of the episode. As far as plot comes, I’m all in. Dialogue was on point, and the writing was pretty good. But my biggest issue with the pilot was the direction and the editing. Oh my gosh, the direction on this was really bad. Within ten minutes, I was saying to a friend that we reached the quota for slow motion scenes. There were way too many. Scenes felt forced, with the music (also not very good) not matching well either. For example, whose idea was it to have the mom running to the crime scene? It was awkward and weird. I mean, it so happened to be her kid, but that felt more silly than it did stressful. Also, when the mom crossed the line into the crime scene, she cross right in front of a guard. Literally. I mean, come on. The crying scene with the Solanos was way too long. Mark’s walk to his son’s body for identification took an awkward amount of time (I blame music on that one too). I could go on. But overall, editing and directing did not do a good job on this pilot in my opinion. Execution was bad, but the show itself was good. I especially like that the killer, assuming it’s a cast member, could literally be anybody. And that alone deserves credit. So overall, I’m intrigued by this show. I’m all in, and hopefully the season issues will iron themselves out. Can’t wait for episode 2. In the meantime, it’s off to Broadchurch, episode 1. I’ll tell you what I think.